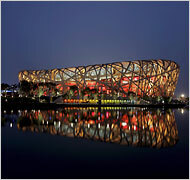 Rocking Offkey: The Bird Nest is...Empty! I have a friend who always tells me artists are big Huyou - the Chinese term for deceit. "The more famous ones are the bigger huyous" he would say, "they appeal on a higher level." Not sure how much his views had influenced me, but when NYT published an Interview of Ai Weiwei, an artist whose name is associated with the design of Bird Nest and a classmate of Zhang Yimou, I flocked to see what his huyou was. The NYT's blog called Ai "Bird’s Nest Designer", but a more proper term would be "artistic consultant". Although I guess he won't protest being called designer, only that he has an issue with Olympics, calling it a "pretend smile". Q: What inspired you in designing the National Stadium? Can you describe the design process? Ai Weiwei: The design concept for the National Stadium came from a complete “emptiness,” when Herzog & de Meuron and I were talking about the initial plan before we started on the actual design. We emptied our minds, which made it possible for us to find the best points from aesthetics and practicality. The rationale of the structure, its exterior and interior appearance, called for a maximization and unification of aesthetic functions and actual needs. The sense of totality was critical in the initial conception of the design. During the process, we were anxious and excited. We hoped to produce a language that possesses a unique form that is able to support many functional requirements. The entire design process was carefree and fun, it seemed very clear and obvious, free of any obstructions of traditional notions. OK, so the design concept for the National Stadium came from a complete “emptiness”? What's inside emptiness? Does emptiness has emptiness? Is the steel beams emptiness? Aside form the usual cliches that follows, the whole answer leaves me feeling pretty...empty. Hmm, artistic talking, pretty huoyou. Q: Are you going to the opening ceremony? Ai: I’m not attending the opening ceremony, I’m not interested in it, and I haven’t received any invitation. If I need to be more clear on why I’m not willing to be part of the ceremony, it’s that I think it’s too far from the spirit of freedom. I’ve always thought of this ceremony as a product of government bureaucracy, rather than a natural celebration and expression generated among free citizens. I feel that there are too many regrets in this ceremony, which could make me unhappy. Was it really "I’m not interested in it" or "I haven’t received any invitation."? Now I was really confused. Was he really trying to distance himself from the Olympics after he joined the design of the stadium and reaped financial and press gains? If not for the "designer" title associated with the stadium, few Chinese would have known his name. His double position was very much Chinese. Chinese intellectuals have a tradition of accusing others, say deploring the lack of free speech, and turning around doing exactly the same. All artists are expected to have an edge, but still...Can you say Houyou? Ai went on to say people in a society that didn’t have democracy were not possible to get excited and cheer for the game - facts not withstand, and thus the term “pretend smile.” But by that time, I've lost interest in further reading. For the record, out of all newly built stadiums, I like "the cube" the best. Boy, this Ai Weiwei really has the nerve! I've totally no respect for such a chameleon. HouYou!